I occasionally like to share what is popular in my Etsy shop in different seasons, so what are the bestsellers in my Etsy shop this week? Available now in my Etsy shop – the complete kit for my popular duckling crochet pattern! Read on for all the details on this eco-friendly duckling crochet kit. 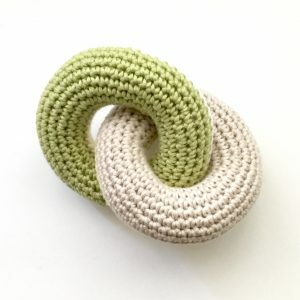 Today I’m revealing a new crochet pattern for these very pleasing inter-linked rings, and in addition to just the pattern, I have also created a complete kit to make it super-easy for you to run these up. I’ve just listed a brand new crochet kit for a cute red-and-white Christmas stocking ornament. Not only does this Christmas stocking crochet kit make a wonderful, eco-friendly Christmas gift, it is also a perfect pre-Christmas project or gift, because you want to make your ornaments in plenty of time for the big day, right? What’s been most viewed in my Etsy store this week? 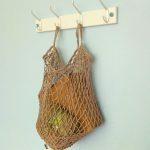 People are obviously feeling very creative in May as they are all crochet patterns and kits! Top of the pops is my robin crochet kit. 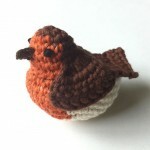 Closely followed by the digital download of the same robin crochet pattern. Next up is my vintage bag pattern, adapted from an elegant 1930s pattern I inherited from my Great Aunt. 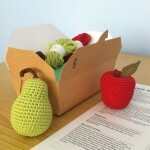 My apple and pear crochet kit. I expect lots of people have teacher gifts in mind at this time of year. 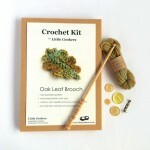 And also in the top five is my very limited-edition oak leaf brooch crochet kit. Little Conkers Craft Coffers – The Reveal! It’s time I let you see what was in my Pre-Christmas Surprise Craft Coffers, I think! These are all gone, and won’t be repeated in exactly the same form, but I’m planning other Craft Coffers on different themes in 2016. Doesn’t everyone love getting a surprise in the post? 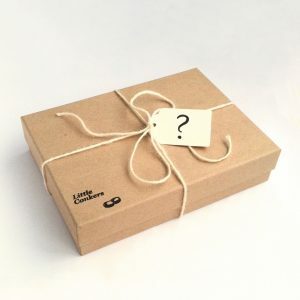 Surprise craft kits, delivered to your door, or to someone you love, for a sustainable, creative, crochet treat in the run-up to the festive season.